Geez this year is going by waaaaaaaay too quickly for my liking. Work, wedding planning and general exhaustion have taken over my life lately leaving little time for blogging unfortunately. I'm back today with a quick glitter gradient mani I did a while back using Glitter Gal Crushed Ego and Imogen. I used 2 coats of Crushed Ego and 2 coats of Imogen at the tips. I loved wearing this combo and I didn't want to take it off! With topcoat, Crushed Ego loses some of it's holo-ness and gets this almost glowing duochrome effect. It's very cool! I've lost my blogging mojo so please bear with me while I try and locate it x) Thanks for looking as always! 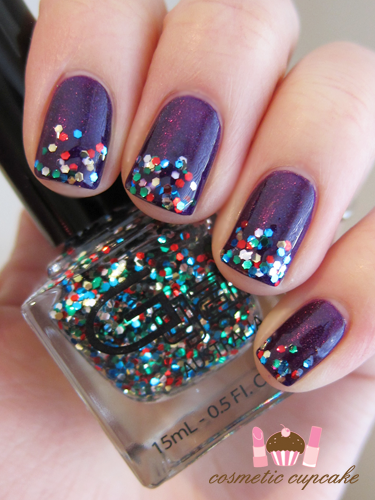 This is a pretty mani, love the compliment of glitter. Oh my gosh! I just did a gradient mani today too! Haha! *twilight zone* Great minds think alike ;) Yours is stunning dearie, that chunky glitter...*clutches chest*...oh its just beautiful! I love the gradient, it is really pretty and I need to start trying out some gradient nails myself!